Fans of classic holiday films and songs—not to mention big dance numbers—will find much to love in Irving Berlin’s White Christmas. Faithful to the storyline of the 1954 film starring Bing Crosby and Danny Kaye, Irving Berlin’s musical opens with World War II buddies Bob Wallace (Jeffrey Correia) and Phil Davis (John Scacchetti) marking Christmas 1944, as the war is winding down. Right from the start, the musical gets the audience in the mood for the holidays with a “Happy Holiday”/”White Christmas” medley. The plot involves efforts by Bob and Phil to stage a show starring two lovely singing sisters—Bob and Phil’s love interests, Betty (Rachel Rhodes-Devey) and Judy (Vanessa Sonon), along with a group of enthusiastic chorus members—to save a failing Vermont inn owned by their former commander, General Waverly (Michael DeVries). It’s a festively fun holiday show-within-a-show. Revived on Broadway in 2009, with a National Tour in 2014-15, White Christmas received two 2009 Tony Award nominations for Best Choreography and Best Orchestrations. It also received 2009 Drama Desk Award nominations for Outstanding Director of a Musical, Outstanding Choreography, Outstanding Orchestrations, Outstanding Set Design of a Musical, Outstanding Costume Design and Outstanding Sound Design. Onstage at the Arts Center, December 7-31, White Christmas is a must-see classic wrapped in a lavish new musical that everyone should put on their wish list. In fact, tickets to the show make the ideal present for the most hard-to-buy-for friends and family. 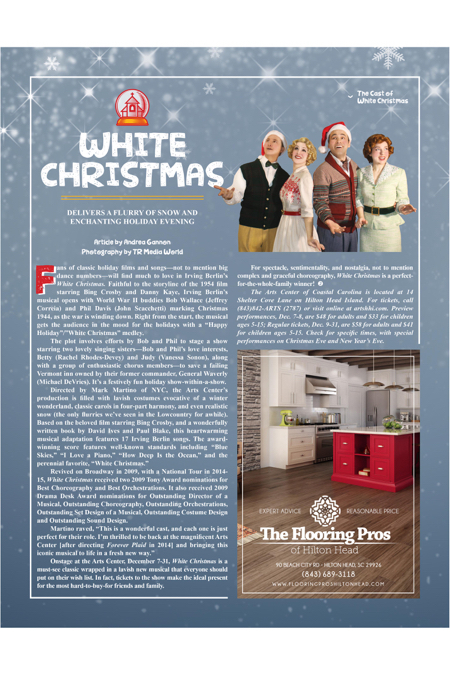 For spectacle, sentimentality, and nostalgia, not to mention complex and graceful choreography, White Christmas is a perfect-for-the-whole-family winner! The Arts Center of Coastal Carolina is located at 14 Shelter Cove Lane on Hilton Head Island. For tickets, call (843)842-ARTS (2787) or visit online at artshhi.com. Preview performances, Dec. 7-8, are $48 for adults and $33 for children ages 5-15; Regular tickets, Dec. 9-31, are $58 for adults and $41 for children ages 5-15. Check for specific times, with special performances on Christmas Eve and New Year’s Eve.